“We can name the province of everything that has a mother. 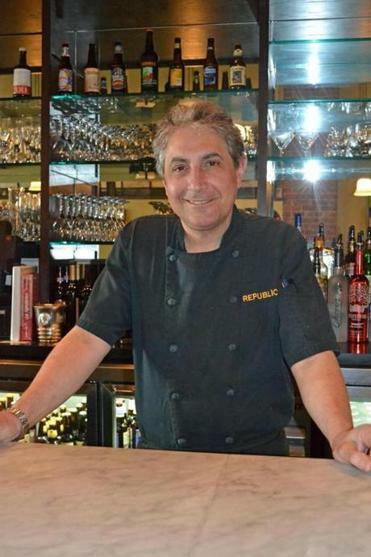 The fact that our customers are appreciative of that is an indication of how much this city has changed,” said Edward Aloise, Republic Cafe co-owner. MANCHESTER — It was barely noon and the dining room at Cotton in the downtown Millyard district downtown was hopping. Girlfriends huddled at sunlit tables in front of a bank of large, plant-filled windows; tables of businesspeople talked shop while grabbing a quick lunch; solo diners crowded the bar. It’s a common scene in plenty of urban areas, but we didn’t expect it in this former historic mill town, with a scruffy, down-and-out reputation. We had it wrong. The once untidy and tatty city of Manchester is changing. The run-down buildings in the Millyard District have been renovated and now house company start-ups, high-tech firms, and contemporary lofts. The Verizon Wireless Arena, the world-class Currier Museum of Art, the minor league Fisher Cats’ stadium (officially the Northeast Delta Dental Stadium), and the restored Palace Theatre are luring visitors to the city and pumping energy into the downtown area. Also, a group of passionate and talented chef-owners are changing the city’s culinary landscape. Paige was one of the people who spearheaded the movement, taking a risk when he opened Cotton (75 Arms St., 603-622-5488, www.cottonfood.com, entrees $14.95-$28) nearly 14 years ago in an old millyard building. A former chef at the Canterbury Shaker Village, Paige brought with him a strong farm-to-table ethos, a growing list of local farmers, and a talent for creating updated, casual comfort food. It’s a formula that’s paid off. “People realize that they can get a really good meal here and support local producers,” says Paige. Diners continue to rave about his signature dishes, like the blue mango veggie burger, the almond-crusted turkey schnitzel served with cheddar cheese gratinee and buttered green beans, and the crave-worthy buttermilk fried chicken. Photos: Dining in Manchester, N.H.
Read: Sculpture Park attracts hikers in Brookline, N.H. The convivial, hip space, patterned after European-style cafes and bars, is fast becoming a favorite among locals and visitors alike. The varied menu covers a wide range of price points. Cold and hot mezze plates may include whipped feta with harissa, North African-spiced pickled vegetables, and Spanish meatballs with almond sauce; main items range from salads, flatbreads, and panini to Moroccan red lentil stew, vegetable tagine, and falafel fried fish with thin, crispy, hand-cut fries. 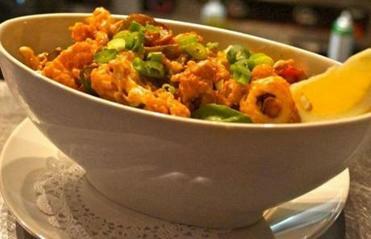 The specials change twice a day and feature at least two vegetarian offerings and a fish dish. The fish comes in fresh six times a week (none is flown in or farm-raised) and 100 percent of the restaurant’s protein is raised on vegetarian diets in New England. The atmosphere is casual but dynamic, as people come and go throughout the day. “There’s always someone in here,” says Aloise. “You might find someone sitting at the bar having eggs sitting next to someone with a martini and steak. Newly-opened N’awlins Grille (860 Elm St., 603-606-2488, www.nawlinsgrille.com, entrees $15.99-$24.99) has Cajun and Creole cuisine (think: shrimp creole, jambalaya, and crawfish etouffee) and live jazz music several nights a week. Across the street, is the recently-opened XO on Elm (827 Elm St., 603-560-7998, www.xoonelm.com, entrees $18-$31) with globally-inspired cuisine and a variety of gluten-free, vegan, and vegetarian offerings. Small plates include a Middle Eastern sampler of house-made hummus, tzatziki, tapenade, and babaghanouj, apricot chile ginger wings, and marinated quail wrapped in bacon and stuffed with corn bread, blueberries, and goat cheese. Entrees range from braised beef ravioli and Southern fried chicken to lobster mac and cheese andchile pomegranate glazed salmon. There are a couple of steaks on the menu at XO, but if you’re craving red meat, head to Hanover Street Chophouse (149 Hanover St., 603-644-2467, www.hanoverstreetchophouse.com, entrees $24-$56), consistently ranked as one of the top steakhouses in New England. The dining room is what a handsome steakhouse should be: dark woods, rich leathers, and warm lighting, and their dry aged cowboy ribeye served with a side of portobello fries is memorable. Hanover Street is a fun, vibrant place, especially during warmer months when it’s closed to cars. Steps from Hanover Chophouse is the lively Ignite Bar and Grille (100 Hanover St., 603-644-0064, www.ignitebng.com, $15.99- 23.99) serving flavor-packed dishes such as the jerk-marinated sirloin steak and sea scallops casino with shallots, pancetta, spinach, and tomatoes, topped with melted feta cheese. Next door, and with the same owner, is tiny Hooked (110 Hanover St., 603-606-1189, www.hookednh.com, entrees $19-$29) specializing in ultra-fresh seafood and bold preparations. The cioppino, which owner Neville Pereira calls “the whole ocean in a bowl,” is a top seller, along with the perfectly crisped calamari (one of the few fried dishes on the menu) served with a cayenne lime aioli, and the spicy tandoori grilled salmon. Already, more restaurants are planning openings in the downtown area and chefs are welcoming the competition.